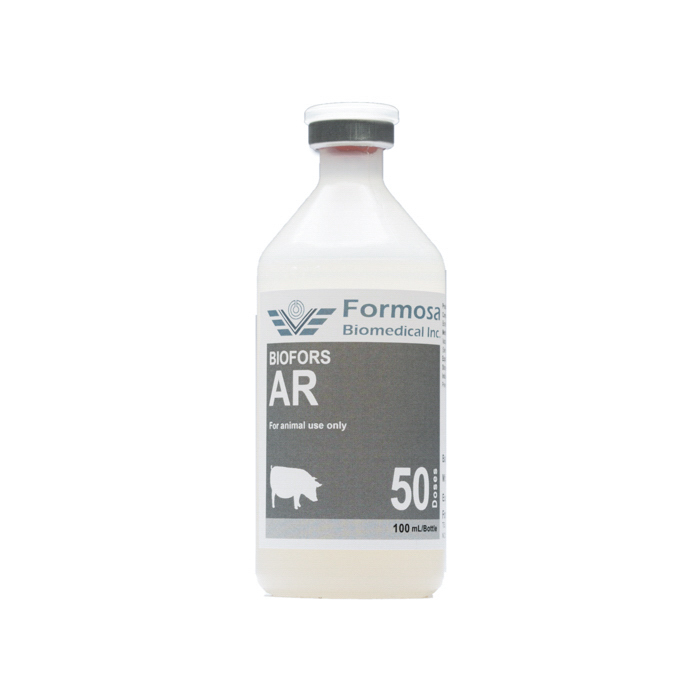 BIOFORS AR contains inactivated Bordetella bronchiseptica which was amplified in culture media. Culture media containing amplified Bordetella bronchiseptica were harvested and subsequently inactivated. Aluminum hydroxide gel was then added as adjuvant. Prevention of swine atrophy rhinitis in swine. Store in a dark place at 2 to 8 ºC. Do not freeze. ·Do not store at 0ºC or below. ·Observe the healthy status of each swine. Do not vaccinate swine showing unusual symptoms. Vaccinate healthy swine only. ·Use sterilized equipment only for vaccination. Sterilize the injection site with 70% alcohol. ·Do not save unused vaccine for later administration. Sterilize vaccine and vaccine containers by autoclaving before disposal.